The U.S. government has warned airlines to pay particular attention to the possibility of terrorists attempting to hide explosives in shoes, a result of new intelligence, according to two people familiar with the situation. The officials stressed there is no specific threat or known plot. Intelligence collected by the United States and other countries has indicated terror groups have been working on new shoe-bomb designs, the sources said Wednesday. That knowledge prompted the Department of Homeland Security to warn airlines to be on the lookout for possible explosives hidden in shoes on flights from overseas to the United States, they said. Shoe bomb's, diaper bombs,hat bombs, hair bombs,what a world we live in . Shoe bombs on the web bombs they really want us dead I just don't understand it . I hope we can get to the bottom of it quickly . When we as Americans plan that great family trip across our great nation on that first summer family vacation with the kids, as they get to visit the sun setting on the Grand Canyon or their first time they explore the rides at Disney World. After that dreaded day of 9/11 when terrorists attacked the greatest culture city in the United States of America New York City, when innocent lives where lost and family's across our great nation got together to remorse and to combat terrorism around the world. Terrorism is not just limited to the stereotypical terrorist of Muslim Americans trying to blow up an airline like in the series 24, a terrorist can be the Hispanic American sitting next to you on the flight, or anyone who has a vision to kill innocent Americans travelers on airlines. As an American who loves to travel across our great nation and international as well, we need more security in our airports and better culture understanding programs to curb terrorism in own backyard in America so our young children are not brainwashed with the idea of spilling innocent, blood for a false ideology which some Middle East terrorism groups try to recruit young men and women for their sick cause's. Billy Joel once said he is a New York State of Mind after 9/11 attacks on America, most Americans like myself would agree with him that traveling on an airplane is much safer, then it was over twenty years ago with our new technology which detects bomb's before they enter an airplane and the friendly, TSA and Homeland Security guards to make our air travel trips safer and much more enjoyable form the next wave of terrorism attacks for years to come. Hi, there in the USA! 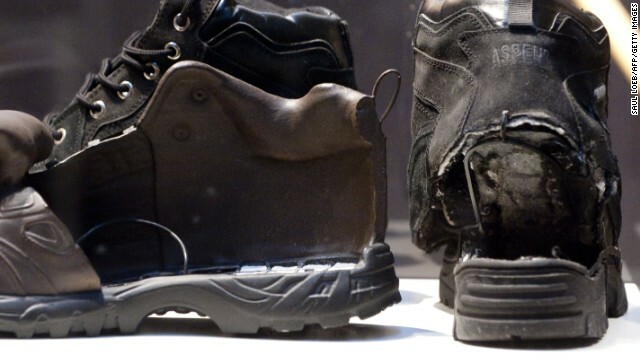 This kind of fatalism by using shoes to plan a kind of attack unknowing place shows todays the situation of world. attackers or aim or group home-place or nothing else etc. you have not a pair of shoe. Being a kind of friend everyone I have got every moment and every place the quit of informations which means hundreds of places safing many lifes without being like a hero. Why do we inconvenience everyone when the preponderance of evidence has established that it is people who practice islam who are the terrorists who threaten our skies? It's not little old ladies in wheelchairs or Chinese students, nor Methodists. It's time to start profiling those who come from muslim dominated countries Those that are going to muslim dominated countries. Those who are of middle eastern or African descent. And anyone who raises an eyebrow. It's time for common sense. Something that the U.S. seems to be in short supply of.